Paul Northup, one-time leader of seminal British folk rock band EDEN BURNING, spoke with Tony Cummings about the band's history and recorded legacy. The surprise reunion appearance of Eden Burning at Greenbelt 2003 left many nostalgists watering at the mouth for the band's engaging, intelligent folk rock while the subsequent release of 'The Hatchery 1990-1996' compilation (available for download from www.ffg.org.uk) demonstrated further that the band, from their formation in 1989 to their passing in 1996, were pioneers in the evolution and creative development of British music carrying a spiritual message. Cross Rhythms asked Eden Burning's vocalist and composer Paul Northup to take time off from his current band Bell Jar to make a few comments about the much loved Eden Burning discography. We were lucky enough to know a guy living in Cheltenham where we lived called Dave Pick of FFG Studios. He was running a studio out of the basement of his home at that point. He financed us recording this. We did it ever so quickly, just in evenings because he was full time at work just then; just in the evenings at his home. We had originally started with a fiddle player who was very much a part of our band. We used to be called Voice In The Wilderness and we played on the fringe at Greenbelt in the late 1980s. Victoria, who was our fiddle player, is actually Charlotte's older sister. Charlotte is our whistle player and the acoustic guitar player. But then Neil Forrest came into the band. Neil loved the sound of the mandolin, he just wanted to play it. We did like The Waterboys I must confess, so yes, we were naturally going to use that as an inspiration but it was not calculated, it was quite natural. I've got to be honest and say that the telephone call we got from Cross Rhythms saying how much you liked the songs on 'Thin Walls' changed everything for us. In a way it's true to say that the encouragement we got from Cross Rhythms was instrumental in us eventually going full time and developing the belief that we were doing something worthwhile in Kingdom terms. They were the next little batch of songs that came together. We were by then getting really keen and were beginning to take more gigs. It contained what became what I think was one of our most loved songs, "Much More Than Near" itself which contained a very archetypal folk jig type in there with the mandolin. It was very folky, it had a very strong melody and yet theologically it was very Christian creation focused as well. We went full time with this album. We were by that time getting invited to play at festivals like Crossfire in Liverpool and in fact it was at that June weekend at Crossfire, Liverpool that we launched this album. It felt like we were getting going then. We were really setting out our stall! We did a huge amount of concerts. I have got the wall charts somewhere at home still, all wrapped up. I reckon on average over a five-year period we did at least three gigs a week. Sometimes it was more intense than that, but we just got out and played to as many people as we could. We loved it but we certainly didn't think, 'How much are we going to earn from that.' In the early days if someone invited us to come and play - if it was at the smallest church, a lunchtime gathering or a school assembly - we would do it and we did that for two years. Admittedly, towards the end we tried to get more selective, to move towards gigging in particular contexts, but in the early days we just did anything and everything we were asked to do. That was an important album, a bit of a watershed. It marked the end of the 'Vinegar And Brown Paper' period. In fact we recorded 'Smilingly Home' at the end of what we called the Vingegar And Brown Paper Tour which was our first sort of "proper tour" which we put together. We went all the way up to Aberdeen, down to Plymouth and round and back. We recorded 'Smilingly Home' when we got back to Cheltenham and at that stage Neil was our real inspiration. He was the hub of the band. He was the main songwriter, the energy, the whole thing really about us. We cohered around him. Then he said he wanted to leave. He suffered a lot with mental illness and he would not mind me saying, he is diagnosed bi-pola but he did not know that at the time. Now, looking back, he was just on his way into his first big bout of depression. We didn't know, he didn't know. He just announced he wanted to leave the band. He now says it was the worst decision he ever made. We respected his decision, but it left us feeling really bereft because we thought, "He writes all the songs, he IS Eden Burning." Neil's replacement was just a young guy from our youth group who had been doing our sound for absolutely no money, chugging around in our little van up and down the country, twiddling knobs. He said, "Well, I will try and learn the mandolin," so that tour saw him shadowing Neil and just learning. This was the first album which we recorded without Neil and with Charlie, his replacement. Okay, Charlie had learnt to completely mimic, to keep the sound going so we could be consistent after Neil left, but understandably as we settled down into being ourselves again that was not his natural first instrument; he was an electric guitarist. So 'Mirth And Matter' marked a sort of transition where there were still mandolin elements, but more and more of Charlie's own character coming in too. Also, this was our first album where we were learning how to write songs without Neil so we all think of this as quite a dark album. It was quite a struggle. We also were really struggling with our church which we had grown up in, had provided us with all our support to go out and do this touring. We just felt a bit under-nourished and misunderstood by our church. It is difficult to pick up, but for me personally when I listen to this album it charts a period where we were feeling quite, not unloved, but to do what we did you needed to come home and have support, direction, oversight and all that stuff. I just didn't feel like our church was getting who we were and what we were trying to do at all and we were a bit isolated by them. By releasing a single I think we wanted to gauge numerically where we could benchmark ourselves against the mainstream. So we thought, "Well, let's utilise the hundreds of lovely, loyal, committed fans who come to our gigs, let's try and, 'exploit' is the wrong word, but let's try and utilise that and say, 'Look, buy our single,' and let's see where we can get in the charts. But we did it off our own back, no plugging, no infrastructure which you should really have in place. But we gave it a go; it was just a test more than anything. I have got to say the two singles we released contained some of our worst songs because I think the project of releasing a single became more important than the song itself. We lost sight of just being who we were and to keep writing songs and trying to reflect our faith in our songs. The project of this single and how well it was going to do became the key thing. It was called 'Brink' because by the time we made this album we were already beginning to think amongst ourselves that we had run the course as far as we could take it, so we felt as if we were on the brink of something. Again, it sounds naïve looking back but we thought that pretty much by then as a group of friends we had got just about as good as we could get at writing songs and at playing live and so this was a brink. It was either going to propel us to some further opportunities, to some wider form of music ministry or it was going to mark the end of something which we just needed to say, "That is enough". So that is why we called it 'Brink', because we were on the cusp of something and we all knew it. Tony Cummings is the music editor for Cross Rhythms website and attends Grace Church in Stoke-on-Trent. 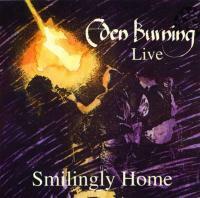 "Smilingly Home" remains one of my favourites of all time as it is one of the most exciting live albums I've ever heard. It had such an impact on me at the age of 16 that it made me want to take up Mandolin too! I had the pleasure of seeing them play at Greenbelt and in Basingstoke in the 1990's and they were superb. The albums have stood the test of time and like PFR and Split Level they are sorely missed in the world of contemporary Christian based music. I first heard the Mirth & Matter album from a ministers son whom I played guitar with when I was 15, I am now 32 and would love to obtain a copy after losing my 'old' cassette copy when I recently moved house. Please could you help me?? 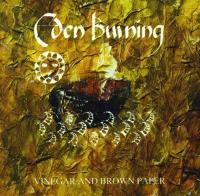 i saw eden burning one year when i was on a salvation army holiday + fellowship and was blown away by there music. since i liked folk rock anyhow it really impressed me since it also had an important mrssage. This was a great band, I saw them a couple of times, Crossfire, Aintree and at Stuart Road Baptist Church. The concert at Stuart Road was special because followers from all over the UK came to watch. a great band! saw them live at Crossfire Liverpool '91 and bought a few albumns after that! also started a semi lover affair with 'folk' music for me.